Displacement of Oromos and Somalis in Eastern Ethiopia continued despite statement by authorities that they had put an end to the crises that was sparked by land dispute between the two ethnic groups. The number of Oromos displaced from the Somali region and Somaliland has reached 70,000. But the numbers of Somalis displaced from the Oromo region remains unknown. 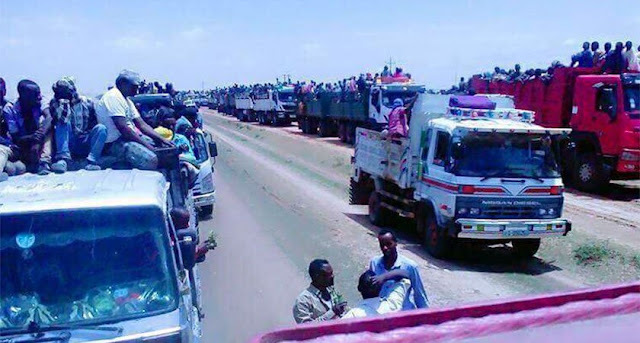 The national defense forces were seen accompanying Somalis leaving the Oromo region, according to reports by local media. Rayis Abamecha, an Oromo displaced from Jijiga said he left behind a hotel that he owns and Jijiga was the only place he knew. The father of four said his money and valuables were looted. He said the looting and displacement was happening while members of the defense forces looked on. Close observers of the crises blame security forces of the regime for having a hand in instigating clashes between the two ethnic groups.